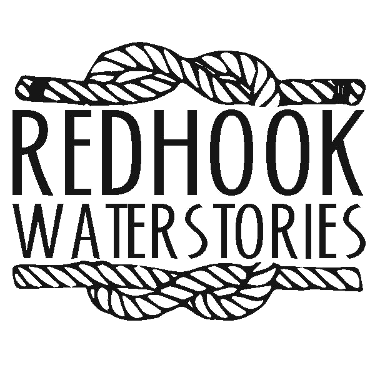 Red Hook's Atlantic Basin was the main port of entry for early Puerto Rican migrants. They traveled on the ships of the NEW YORK & PORTO RICO STEAMSHIP COMPANY" (aka, PORTO RICO LINE). Jose Mendez, comments on placematers,net, that the site was the "Plymouth Rock" of the early Puerto Rican migration for the early Puerto Rican pioneers that came to the United States after the Spanish American War and WWI, 1906 to 1928. NEWS OF SHIPS AND PORTS. 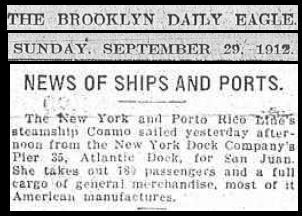 - - The New York and Porto Rican Line's steamship Coamo sailed yesterday afternoon from the New York Dock Company's Pier 35, Atlantic Dock, for Son Juan. She takes out 189 passengers and a full cargo of general merchandise, most of it American manufactures.